On February 28, Canadian workers and labour groups joined others across the globe to recognize the 19th International Repetitive Strain Injury Awareness Day. Initiated by injured worker Catherine Fenech and established by a group of health and safety activists on February 29, 2000, the day helps bring attention to an occupational hazard that affects millions of people across many different sectors. Repetitive strain injury (RSI), also known as musculoskeletal disorder (MSD), refers to a collection of ailments that affect the body’s muscles, nerves, and tendons. Tendinitis, tenosynovitis, and carpal tunnel syndrome are all examples of RSI, and among the most common types of workplace injuries. If you have noticed a burning, aching or shooting pain developing while repeating the same, ordinary movements — like gripping, holding, bending, twisting, cleaning, and reaching — for a long period of time, you have experienced the early stages of RSI. Working in a fixed or awkward posture for long periods of times in combination with fast paced environments, insufficient breaks and lack of recovery time causes an excessive amount of force on small parts of the body, such as hands or wrists, and can inevitably trigger RSI. 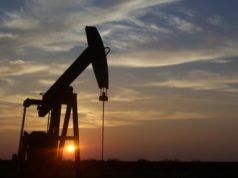 Figures gathered by Statistics Canada in 2001 show that approximately two million Canadians suffered from RSI and 55 per cent of these injuries were caused by work related activities. According to the United Food and Commercial Workers union, one out of 10 Canadian workers is afflicted with RSI and the net cost of these injuries exceeds $26 billion, or 3 per cent, of the country’s gross domestic product. While convincing governments and employers to make RSI prevention a priority has been a huge challenge, organizations such as Unifor, Canada’s largest private sector union, have made significant progress regarding labour movements through campaigns and educational programs. The Canadian Centre for Occupational Health and Safety also offers toolkits and free e-courses to help raise awareness for RSI. The organization’s latest report shares tips with employers to help them eliminate hazards. Tactics include rotating jobs, distributing work evenly among teams, and increasing the variety of daily tasks. However, if businesses and organizations are not able to implement these strategies, they can make modifications to the workplace to better fit worker’s needs. Adjustable desks and assistive devices such as carts, hoists, or other handling devices can reduce the risk of developing a musculoskeletal disorder in addition to training and extended rest periods. As more and more jobs require employees to spend long periods of time in front of digital devices, in addition to personal screen time, workers can also develop a visual form of RSI. Working at a computer is a lot more strenuous on your eye muscles than you may think. Your eyes move back and forth as you read, focus and refocus to process images and text, and adjust to glare and changes in contrast. Edmontonians spend an average of 11 hours using digital devices every day, which can lead to headaches, eye strain, dry eyes, and difficulty focusing, which are all symptoms of digital eye strain. “There is an age-old adage that says the eyes are a window to the soul. For me, they are certainly a window into the health of the body,” says Dr. Aaron Patel, an optometrist at the Alberta Eye Health Clinic in Edmonton and past-president of the Alberta Association of Optometrists. 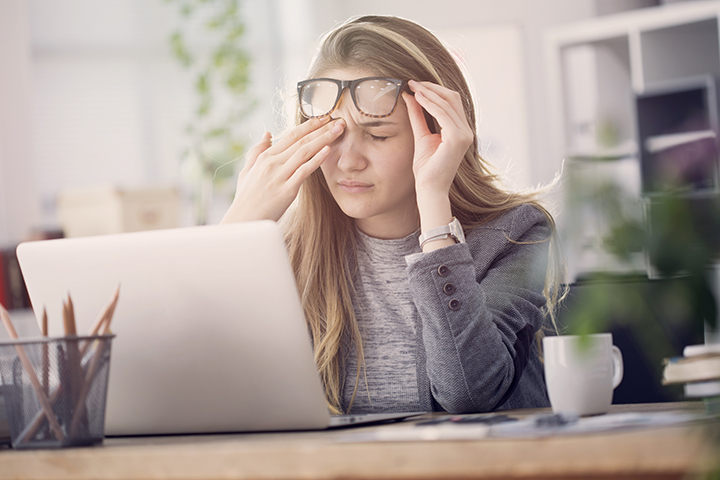 While there can be many reasons why people experience dry eye, it’s a condition that is often present with digital eye strain. According to a recent survey* conducted by the Alberta Association of Optometrists, 90 per cent of Albertans have experienced dry eye symptoms and three out of five people do not use anything to treat the condition. Other steps you can take include setting a timer for screen breaks, blinking regularly (you normally blink 12 times a minute, but when you stare at a screen, you tend to blink only five times a minute creating a lack of lubrication), investing in better lighting for your workspace, and decreasing glare. An optometrist can also help you with computer lenses and glasses to alleviate the symptoms. While an appointment with your optometrist can help with digital eye strain, there are many more reasons an eye exam is important. “Did you know that over half of people who are eventually diagnosed with Multiple Sclerosis first complained about vision loss and pain to their eye doctor? The body is tied together in the most amazing ways. Sometimes vision strain can be the cause of headaches, but an eye exam can provide early signals of a possible brain tumour, aneurysm or bleeding in the brain. Even if someone sees well, they may not realize part of their peripheral or colour vision is being affected,” Dr. Patel explains. In Alberta, children’s (until 19) and seniors’ eye exams are covered by Alberta Health. Children should have an eye exam every year while in school, but the first appointment should take place at six months and a second appointment between two and five years. Adults without any eye issues should be seen every two years, while seniors should be seen yearly. While regular eye exams and the prevention of work-related injuries are important to the overall health of an organization, employers and management must also focus on mental health problems that can arise from these injuries or other trauma. According to the Canadian Mental Health Association (CMHA), in any given year one in five people in Canada will personally experience a mental health problem or illness; and a survey conducted by Ipsos in 2017 found that four in 10 employed Canadians have either been diagnosed as depressed or believe they suffer from depression. “Often, when we think of health overall, we create a dichotomy and separate mental health from physical health, but the components are linked. Our physical, spiritual, mental, and emotional health all impact our overall health,” says Ione Challborn, the executive director of CMHA Edmonton. Founded in 1918, the CMHA is one of Canada’s oldest voluntary organizations. With branches located across the country, over a 11,000 volunteers and staff members provide services and support to more than 1.3 million Canadians every year. “Physical and mental health are almost indistinguishable in the sense that good physical health means the likelihood of better mental health, and good mental health encourages better physical health. You can’t really separate the two of them when you are talking about overall health, and your health needs to be treated for better or worse,” adds Mark Korthuis, president and CEO of the Mental Health Foundation. The Mental Health Foundation does not provide direct services to Albertans. Instead, the organization looks at mental health as a whole across the province and identifies gaps and areas in the system that need support. Through raising funds and mobilizing resources, the Foundation advocates for a barrier-free, easy-to-navigate, and fully integrated addiction and mental health care system—with a focus on community-based programs and services. One of the biggest hurdles for anyone suffering from mental illness is overcoming the stigma attached to it. Since 2011, Bell Let’s Talk Day has been driving a national conversation to raise awareness about mental health and challenge the negative stereotypes that have contributed to a worldwide stigma. Over the last eight years, Bell has donated over a million dollars towards mental health initiatives across the country. However, how can workplaces ensure their employees have access to these types of initiatives once they have reached out for help? Luckily, businesses and organizations have access to a plethora of resources for developing workplace mental health strategies. 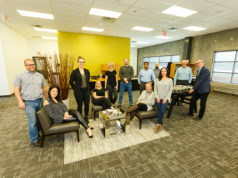 One of those resources is the Colbourne Institute for Inclusive Leadership, which is regionally and nationally recognized as a leader in diversity and inclusion services, applied research, strategy, and customized training solutions that encourage and support organizations in developing and sustaining inclusive cultures. “Within the strategy itself, it’s important to think about the many layers of identities. We aren’t definable by one thing, like our gender or age. We have multiple layers and unique personalities. We want people to think of how they interact with one another, how work shapes them and how they shape work,” says Dr. Lori Campbell, principal of the Colbourne Institute. In Campbell’s opinion, one of the challenges that an organization grapples with the most when it comes to implementing a mental health strategy is the idea of opening a door or starting a conversation but not having the necessary skills to engage with their team. Campbell also recommends workplaces analyze how they conduct meetings and performance reviews, gather feedback, and recruit new team members to see if they are unnecessarily excluding people through policies and language. “We want people to feel acknowledged and that they belong so they can bring their best selves to work, and these behaviours have to be supported by the structures and policies of the organization,” she concludes. * Survey methodology: Applies to those aged 18 and over. An online omnibus survey was conducted between April 20-21, 2017. Eight hundred and four Albertans aged 18 and over were surveyed. The estimated margin of error for the Edmonton sample is +/- 5.7%. Previous articleWell, Well, Well…What Have we Here?